Remove the rubber cover 2 » Fig. 154 on page 170. Turn the connector with the bulb to the stop in the direction of the arrow » Fig. 157 and remove it. Replace the bulb, insert the connector and new bulb and turn to the stop in the opposite direction to that of the arrow. Fit the rubber cover 2 . Remove the bulb holder B » Fig. 154 on page 170 or the bulb holder 3 to the stop in an anti-clockwise direction and remove with the bulb for the turn signal. 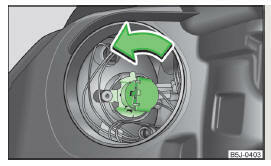 Replace the bulb, insert the bulb holder with the new bulb and turn clockwise to the stop. Remove rubber cover A » Fig. 154 on page 170 or 2 . Grasp the lamp holder and remove it from the bulb housing. Replace the light bulb and insert the lamp holder back into the headlamp with the bulb.